Nam Japo - the recital of the name of God (‘Nam’) or the repetition of sacred verses written in the ‘Guru Granth Sahib' the Sikh sacred text. This has particular significance for the fact that Sikhs consider the Guru Granth Sahib’ to be a living prophet in text form, notated especially for musical recital. These hymns lend themselves to practice and repetition in such a way as to make meditation a central pillar of Sikh practice and were handed to all Sikhs by the tenth of their living human Guru’s ‘Guru Gobind Singh’ as a final guru that will continuously guide its followers. Sikhism teaches that above all, in order to reach salvation an individual must reach an understanding of God, which is best achieved through the recital or inward contemplation upon the names and the true nature of God. Sikhism is not a ritualistic religion as such and whilst Sikh’s are encouraged to recite hymns from the Guru Granth Sahib daily they are not committed, in essence, to formal worship. Sikh’s take an everyday approach to religion, believing that worship and devotion to God is best practiced through their actions and an understanding of their everyday situation. Sikhism is not hierarchical on nature as does not teach Sikhism as the only way to salvation, but rather merely points to the fact that hierarchy, ritual and idol worship are not conducive to discerning the true nature of God. 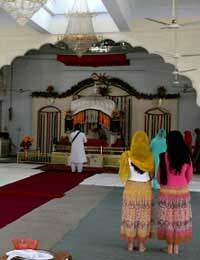 Although symbols and baptismal rituals have developed as Sikhism has grown, its essence remains the same and Sikhs take regulations on their clothing that have been instructed by Guru Gobind Singh on faith, simply because they were instructed to do so, and undue question or importance placed upon these rulings. The importance of actions over adherence to ritual codes is central to the teachings of the first Guru - ‘Guru Nanak’, who himself refused to wear sacred Hindu dress at just 11 years old. Guru Nanak later taught a belief in one God, and that no ritual practice was needed in order to become close to that God. Nam Japo is the principle method of reaching a oneness with God. Notably, this principle is similar to the fundamental principle governing all of the World religions, each of their spiritual founders at some point making a break with what were seen to be the restrictive conventions of the systems that preceded it. Undoubtedly Sikhism, along with Buddhism, holds tightest to this principle. From the point of view of a Western onlooker, it might well be felt that with so many religions to choose from, and with each ultimately teaching that a contemplation of God cannot be achieved through ritual alone, there is little point in adhering to any one religion. Uniquely, Sikhism would not condemn someone for this, in contrast to elements adhering to all of the other world religions who claim that salvation can only be attained by persons committed to their creed. For this reason Sikh meditation may provide an interesting field of inquiry for a Westerner who is spiritually interested, but does not wish to lead commit to a dogmatic system of belief.